The global superbug crisis is a complicated, long-term problem. The video below explains how it starts, spreads and its impact. But there are many other - sometimes surprising - aspects to this crisis. There is one key way in which superbugs start. Whether it is in animals or humans, the initial point is where antibiotics kill off drug-susceptible bacteria, leaving drug-resistant bacteria to multiply. These bacteria contain drug-resistant genes. It is the spread of bacteria among both animal and human populations that then creates superbugs. These superbugs don't respond to our available antibiotics. The end result is that many standard procedures - from caesarean sections to chemotherapy - may become too risky to undertake. It is projected that millions of people may die of what were once treatable infections. Although overuse of antibiotics in the human population is a problem for creating drug-resistant bacteria, humans aren't the only creatures given antibiotics. In fact, livestock is a much bigger problem. Around 70 per cent of antibiotics in the US are consumed by animals. The consumption of antimicrobials by animals is projected to rise by 53 per cent from 2013 to 2030, according to a paper published in Science: from an estimated 131,000 tonnes to 200,000 tonnes. As the chart below shows, the main increase will be in China, unless measures are taken to prevent the overuse. While throwing money at a problem is no guarantee of results, it is an indicator of how seriously governments and policymakers take it. Antimicrobial resistance (AMR) can be prevented by simple solutions such as better sanitation and sensible use of antibiotics, measures that cost comparatively little. However, AMR and drug-resistant genes require research too - into the development of new drugs, the spread of bacteria and other measures that could be costly. Comparing worldwide estimated deaths from diabetes, cancer and AMR-related illnesses to spending by the US National Institutes of Health research from 2010–2014, there is a direct trendline. Cancer research spending of $26.5bn dwarfs the $5bn and $1.7bn spent on diabetes and AMR respectively. But should AMR's estimated deaths increase to 10 million, the current levels of spending look woefully inadequate. Take tuberculosis (TB) as an example. Treating a drug-resistant strain of TB can cost nearly 30 times more than TB that responds to conventional medicine. The full treatment can also take up to two years and 14,000 pills, as well as six months of daily injections. 4) Infectious diseases isn't attracting new doctors. According to AMR Review, the number of applicants for US medical residencies and fellowships in infectious diseases (the area of medicine most relevant to combat superbugs) is below the number of places - at 0.8 applicants per place. This is partly due to the fact that doctors in this area are paid less: according to the most recent Medscape compensation report 2017, in the US doctors working in cardiovascular disease, radiology, or plastic surgery are all paid around $400,000 per year; in comparison those working in infectious diseases get around $230,000. As the chart below shows, antibiotic research doesn’t start to pay off until year 23 of developing a new drug. 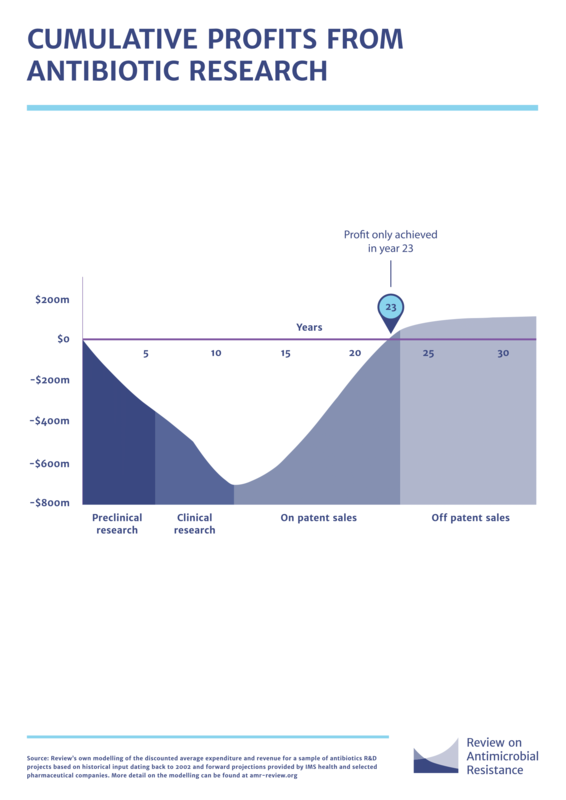 After that point, the drug patent soon runs out and off-patent sales mean profits are much lower. If the process is fruitless at any point before year 23, the company will make a loss. Creating the right incentives to make new antibiotics is another crucial area for combating AMR. 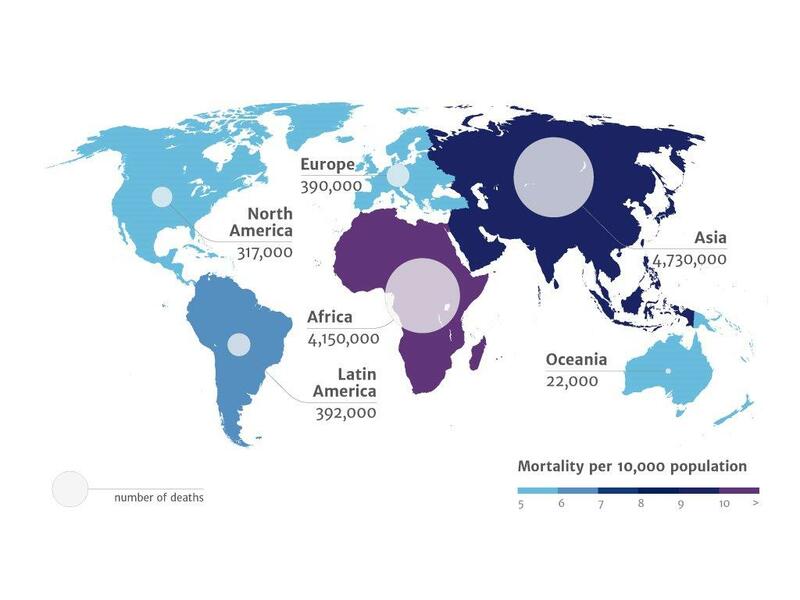 Every area of the world will be affected by superbugs - but in terms of population impact, as the chart shows Asia and Africa will not only suffer more deaths, but more deaths per population. Rob is a journalist, developer and author. He specialises in sport, finance and data.